How do I forward my OSU Exchange mail to OSU Gmail? Caution: The Exchange email system at OSU is tightly integrated with other systems, including calendaring, Lync/Skype and our voicemail system. It is recommended that you do NOT forward mail from Exchange to Gmail. Instead, we recommend that OSU employees forward from Gmail to Exchange. Remove forward on Gmail, if there is one. This step is important to prevent a mail loop. 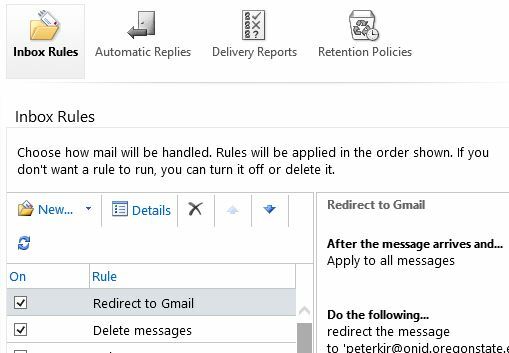 Click the gear icon at the upper-right and choose "Settings"
Set a redirect rule in Outlook Web App. Click on "Options" at the upper-right and choose "Create an Inbox Rule"
Under "When the message arrives" select "Apply to all messages"
Under "Do the following" select "Redirect the message to"
Answer "Yes" to the question "Do you want this rule to apply to all future messages?" 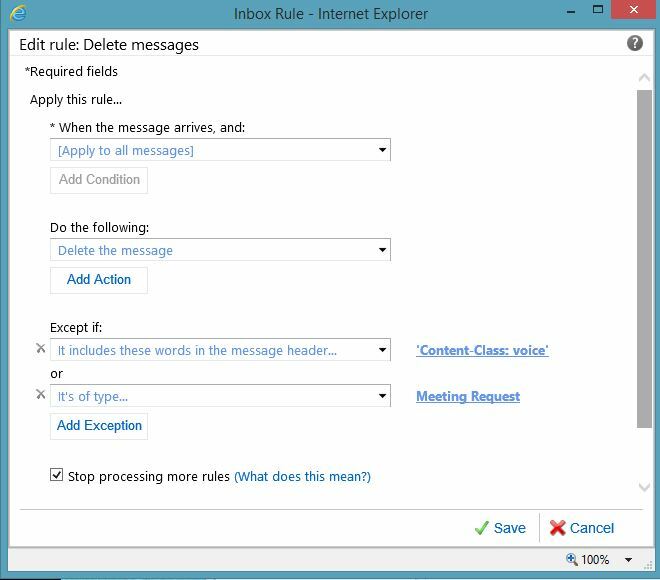 Under "Do the following" select "Delete the message"
Under "Name of Rule" enter something like "Delete messages"
Move "Delete messages" rule below the redirect rule. 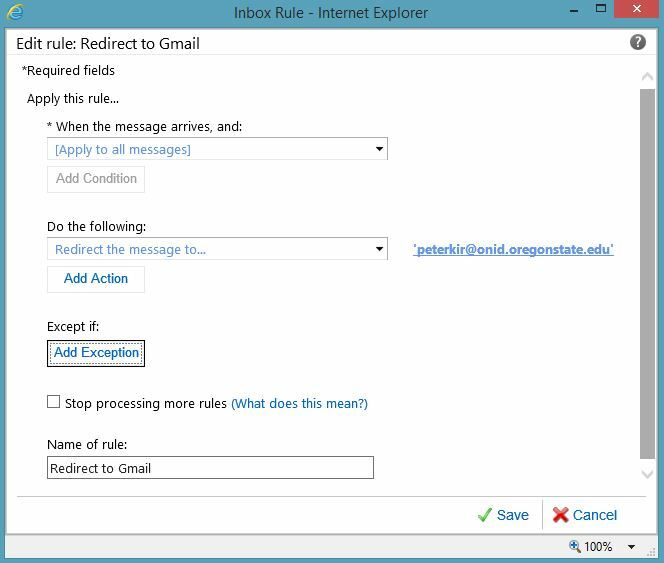 In the "Inbox Rules" menu, select the rule "Delete messages"
Click the down arrow (in the menu above) to move the delete rule after the redirect rule. If you are a frequent Outlook calendar user, it is highly recommended that you do NOT forward your mail out of Exchange. If you forward all mail out of Exchange, no one using Outlook/Exchange can see your free/busy information anymore. This means they cannot see when you are available for meetings. Also, no one will be able to see your availability or meeting status in Lync. If you follow the steps above to keep meeting invites in Exchange, you will need to manage your calendar there instead of in Google calendar. Many people have converged voice mail, meaning that they receive voice messages in their email inbox. If you forward these voice messages out of Exchange, some features of the system are impacted. The voice mail indicator light on your phone will never light up. Also, you will not be able to listen to voice messages using your phone - you will only be able to listen to voice messages via your email. If you follow the steps above, your voice mail features will continue to work, but you need to remember to clean up voice messages from your Exchange mailbox, or using the voice mail dial-in system. Ask your IT team to set a forward from your Exchange mailbox to your Gmail account. They will need to set the forward to point to username@onid.oregonstate.edu. Calendar and free/busy visibility with other Exchange users. Voice mail integration with the phone system. Skype for Business (Lync) presence and availability.